DETROIT, MI-November 22, 2017 –More than 600 guests attended the 46th Amigos de SER Business Recognition Luncheon on Tuesday, October 31, 2017. The guests gathered in the Grand Ballroom of The Detroit Marriott at the Renaissance for SER Metro-Detroit’s Annual Event. It was among the most successful Amigos de SER Luncheons that SER Metro has held. Rico Razo served as the emcee of the event. The keynote address was given by David E. Meador, Vice Chairman, and Chief Administrative Officer, of DTE Energy who spoke about workforce development and the rebirth of Detroit, particularly in the area of apprenticeship programs. 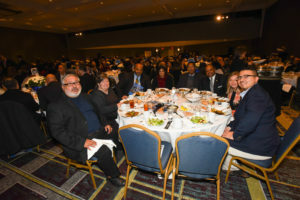 Key highlights: Some of the notable categories and awards this year were DTE Energy, Amigo of the Year; and Wolverine Packaging, Employer of the Year. SER also recognized four graduates, Jason Gnatek, Damari McMiller, Martin Sierra, and Beulah Walker with the “Journey to Success” Award. Two graduates received a $1,000 scholarship towards post-secondary education from the Frank D. Stella Scholarship Program established by SER Metro-Detroit in 2013: Marquita Kennedy and Sara Mendez. Event sponsors included: The Luncheon Sponsor: DTE Energy Foundation; Platinum Sponsor: Bank of America; Gold Sponsor: Comerica Bank, MGM Grand Detroit, Ford Motor Company; Silver Sponsors: FCA Fiat Chrysler Automobiles, General Motors, Wayne State University; Bronze Sponsors: Ambassador Bridge, Pepsi, The Leona Group; Corporate Sponsors: AT & T, Holy Cross Services, UAW-GM; Network Sponsors: Chase, CVS, Comcast, Henry Ford Health Sysytem, IBEW-NECA, MCA Detroit, MOBIS, New Detroit, SEMCA, United Way for Southeastern Michigan, Wayne County Community College District.